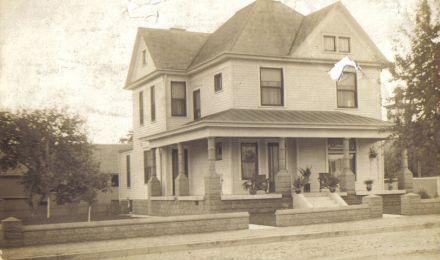 At-the-turn of the century, 1900, a prestigious New Albany family built a beautiful large home at 1501 State Street. It was a handsome, well-cared-for mansion for many years. The house survived a fire in the 1920's, and was repaired with a new "more modern" roof . But by the 1970's it fell into disrepair and had been derelict for a few years. I graduated from I.U. in 1978, and looked to New Albany to start my optometry practice. My Dad and I reasoned this house would be a great location AND my wife and I could live upstairs. When I first showed it to my new father-in-law, he didn't have to say it... I thought it instead... "this is how you're going to provide for my daughter?" Well, we got busy throwing out trash and scrubbing inside. We cleared wild cedar from the yard outside. Everything was painted. We installed new wallpaper and carpet throughout. For the foyer, the dining room french doors would be moved to the entrance of my office reception area. The original oak parsons bench, stairs, and stained glass were preserved. Upstairs, we converted an old sauna room into a small kitchen. I wanted to keep the classic look outside by maintaining the stone porch and courtyard wall. That first Monday morning after passing my state optometry boards, I opened my front door for business. In 1991, we expanded with a new building addition. The Southern Indiana Chamber Of Commerce awarded me their Beautification Award for maintaining the historic look of the building. I was also proud to receive their Professional Person of the Year, Award Finalist, the following year, 1992, ...and again in 2009! Now it's 2017, 39 years later for me, and This Old House is still going strong.